Betty is a native Houstonian (Lamar High School graduate and Honor Society member) and masters-level psychotherapist who was trained and certified in addictions. Her Bachelor of Science degree is from the University of Texas, Austin, and she taught Home Economics and Science in the Houston Independent School District's Jackson Junior High for two years. After raising her children she returned to school for a Masters degree from Houston's University of St. Thomas in Education and Counseling. She has over 20 years participation in 12-step recovery and worked for the Houston Council on Alcohol and Drugs to teach churches how to start ministries to the recovery community. Betty received a Telly Award for the educational film she made on the Fifth Step of the Alcoholics Anonymous program. For five years, she volunteered with the Family Law Center’s drug court which is a treatment alternative to incarceration and counseled for 10 years in private practice. 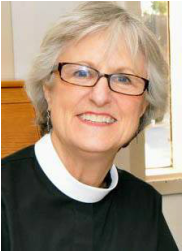 Betty was called to be ordained in 2004 and entered the Diocese of Texas’ Iona School for Ministry, graduating in 2007 in the first class of Permanent Deacons in the Diocese. She assisted St. Mark’s Houston for four years with outreach and led four trips after Hurricane Katrina to rebuild New Orleans and after Hurricane Ike in Galveston; she led six trips to Galveston with parishioners. In the fall of 2010, she joined St. James' Houston as Permanent Deacon. She developed an interest in helping homeless and poor whom she has been helping with her work at The Beacon Day Center and Christian Community Service Center. She is married to Tom Divine, an electrical engineer; she has three grown children and five granddaughters.